Posted by mispapelicos at 3:15 p. m.
It's a really nice outfit. Love your style. Your skirt and jacket are so pretty. Que guapa y elegante. La falda es preciosa, el chaleco y la chaqueta, también. Me encantan estos estampados. Does that mean that you embroidered those butterflies yourself? this look is perfect! I really love the embroidery. It takes lots of time and passion to embroider. You wear a lot of high heels recently. Love it! te veo elegantísima, tienes un arte especial! !, me encanta totalmente ese chaleco brocado, y cómo queda sobre esa falda tan hermosamente bordada, y me fascina esa camisa roja asomando por debajo, el toque de color vivo de la corbata, todos los detalles son tan especiales!!! Me gusta la falda. Es muy original. Te ha quedado genial la falda,que manitas tienes.Voy a seguir tus instrucciones para lo de los comentarios. I'm loving the butterflies!!! I love embroidery, I wish the day had more hours so I could make beautiful things like this as well! Yes, I agree, we have to meet! Next time you come to England let me know! Amazing embroidering you did on the skirt! So fantastic! Just changed my comment pop up settings! Thank you for the tip! How lovely your butterfly skirt! I love it so much, it's so a cute reminder to spring and you look gorgeous in it! 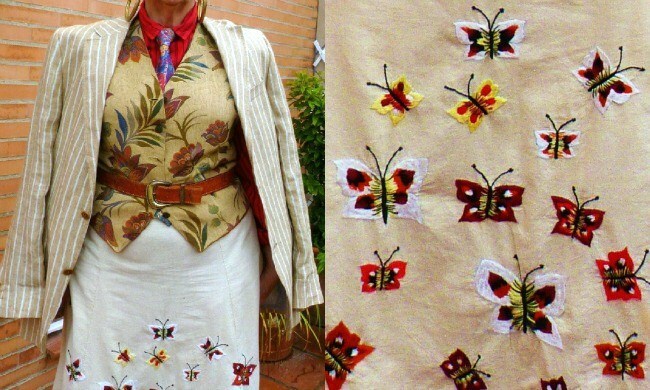 Como siempre el look es genial y las mariposas de la falda me han enamorado. Un abrazo querida Sacramento. the vest is so adorable! love it so much! I adore the butterfly skirt! So feminine and whimsical. Reminds me of spring. Estás a tope en tendencia, eh? Me ha gustado tu adaptación masculina! You look so beautiful and graceful in that outfit dear Sacramento! I adore the butterfly print. Tthe way you mix those different patterns and shapes is masterful! I love popup window for comments - make it so much easier to view the look while writing! Siempre tienes mucho estilo, me encanta este conjunto, vas dispuesta para triunfar. Besos guapa. Thank you for the pop up window tip! This outfit is so perfectly coordinated, and the skirt is absolutely gorgeous! 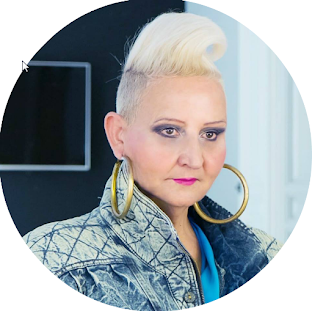 Lots of high end designers should have a look at you for inspiration - you have the most interesting style and eye for print mixing! I'm taking notes for myself! I love the quirkiness of your outfit with the mix of colors and patterns, you look amazing and inspiring as always miss P! You look fantastic. The mix of prints and fabrics is great. El calor de la camisa, a ti siendo rubia, te favorece especialmente. Me encanta los estampados que has elegido. Oh the skirt is so beautiful! You always wear such clever creative pieces, I love this. GFC doesn't work for everybody- mine has been disabled since my email is not the right account. So I can't follow anybody anymore via GFC. Google + seems to be getting some steam to it- I see you are there and pretty active. I see also how handsome a figure you cut in your dandy tie, vest and jacket! What a beautiful butterfly spirit you are! Nos encantan las mariposas!!! Un look ideal. Me chifla la falda!!! llamando a la primavera, eh???? hace falta que hoy tenemos un frio en Barcelona que nos vamos a quedar helaitas perdias, jajajaja. Your embroidery skills are wonderful, and the whole outfit is a triumph. Que bonito el detalle de las mariposas bordadas Sacramento! Que chaleco más chuulo Sacramento. Llevaba tiempo sin vistarte pero aquí estoy. Love your outfit Sacramento! The butterfly skirt looks perfect with the fitted vest. I love all the warm, earthy colors. Que bonita la falda. Y muy original llevando corbata, te atreves con todo. I love those buterflies and flowers together, it's amazing ! Besides being a great talent, you are a work of art. Love the men's touch over all that prettiness! Me encanta el mix de estampados, pero que estilazo Sacramento !!!! I love the look, it's really gorgeous!!! You are always so stylish and chic! Brilliant images as always Sacramento. I love those butterflies on your skirt. Also great homage to The Beatles a few posts down, how amazing that your husband got to meet them! I love these butterflies! They have a very special meaning in our family because they remind me of my mom and dad. My parents are no longer with us but I often see butterflies at unusual times and I have always felt that my parents sent them to me as a sign that they are still with me. Thanks for the lovely reminder. Hope you are having a wonderful weekend! You look amazing as always :) You're an inspiration, my friend ♥ Besos! Very nice outfit. I was staring at the butterflies thinking "this skirt must have been expensive" and then I read you did it yourself! Bravo, what a good job. All the colours and prints (LOL) go so well together in this outfit. As far as thepop up instructions go... Sorry got lost. I got as far as dashboard, settings and "post and comments" but no mentioning of any pop up window. So I hope this comments is visible to everyone. Amazing skirt, I'd love to be able to do such a great embroidery!! The manswear used as an accessory is wonderful!! I'm a fan of the old google friend connect too. Your waistcoat is perfection. And the skirt is self embroidered?? Clever! Sacramento, what a lovely butterfly skirt and your shoes are amazing! What a joyful skirt! I love butterflies. You look beautiful! Gracias por los detalles informativos porque son cosas que aveces yo no sabia. Que maravilla de mezcla de masculino y ultr-femenino en este outfit! great mix of prints and colours. amazhing as always. You are always so beautiful and stylish. I am reading a book and the main character I have envisioned as you. You just are in my mind as I see her. I just love the way you mix patterns. This is one of my most absolute favourite outfits of yours, I love the colours, the prints and the texture combo's, so lovely! You must have embroider by hand? The butterflies are so pretty! love your outfit, that skirt is wow and the details are fantastic. Fabulous outfit!! I am in LOVe with the butterfly skirt!! i love your mix of colors and textures. what a fun outfit! Good idea to place the flowers near the butterflies, so the don't have to travel far !!! Your imagination is the one that does it. Dandy butterflies indeed. And you did that yourself? Does you creativity never end? No me puede gustar mas este outfit, haces mixes de prints y la ralla diplomática del blazer hace mucho, en definitiva me gusta muchísimo!!! me inspira y me llena de ideas!! Te he echado de menos pero ya todo bien!! y me pasare mas seguido por aquí para inspirarme!!! Hi Sacremento - how divine are the butterflies on your skirt. You did that. I'm impressed. Happy day sweets, looks sunny and lovely where you are. Wow me encanta este look, Sacramento!! esa falda es un sueño! have a lovely evening, stay blessed and keep bring the wonderful details you rock!!! have a lovely evening, stay blessed and keep bringing the wonderful details in modern vintage you rock!! Fabulous outfit. I love the jacket and tie. I think I'm in pop up window already but not sure. Ahh, those lovely little butterflies all over your skirt. And you made them yourself too. They look perfect for posing in the garden terrace while wearing one's husband's shirt and tie, et. al. Este look sinceramente se merece un 10, por la mezcla de texturas y materiales y la combinación maravillosa de prints, no se puede aguantar todo tu esitlo jaja es imposible! It's a really beautiful outfit. Your skirt and jacket are so pretty. Have a wonderful Sunday dear Sacramento!! your amazing! love your glasses!